In this Nov. 11, 2018, file photo, Scarlett Johansson, Female Movie Star of 2018, poses in the press room during the People's Choice Awards 2018 at Barker Hangar in Santa Monica, California. A run-in with paparazzi frightened actress Scarlett Johansson following a taping Monday of "Jimmy Kimmel Live," police said. Johansson was leaving the taping of the late night talk show with two people and was not driving, Capt. Steve Lurie of the Los Angeles Police Department Hollywood Division said. The actress believed paparazzi were following her in a dangerous fashion and was frightened, Lurie said. After stopping for a while, Johansson was able to make it home safely, police said, and no charges were filed. 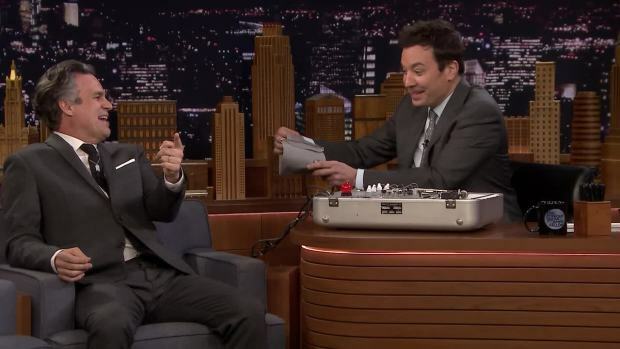 Jimmy hooks up notorious movie plot spoiler Mark Ruffalo to a lie detector to get the truth about "Avengers: Endgame."